Men's Health Week 2014 will take place from the 9th to 15th June and will focus on health and work. More information will be available soon. To stay in touch sign up for our eBulletin newsletter. In the meantime, read all about Men's Health Week 2013 below. Men's Health Week 2013 saw hundreds of events take place around the country attracting lots of news and online coverage. 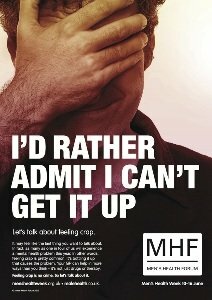 In Men's Health Week, the Men's Health Forum asked men to talk about feeling crap and challenged health providers to enable them to do it. Here are some of our favourite links from the week. How are you - feeling crap? Health info from malehealth. North West Evening Mail - Can men face up to mental illness? 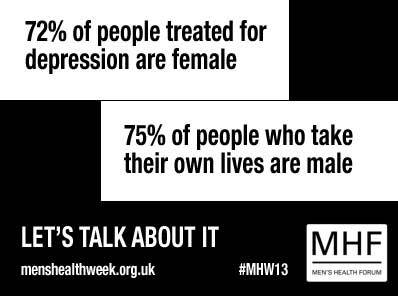 The MHF Men's Health Week podcast. Download it from PodOmatic or from itunes and subscribe to it. Many organisations carried news and blogs about their involvement in Men's Health Week. Here are just a few. Does your PCT have a gender duty scheme? What would make you go to the doctors? AAA screening: is extra surgery worth it? Does it always pay to advertise?